Bite-Sized: Minion | Wake up, Meeples! 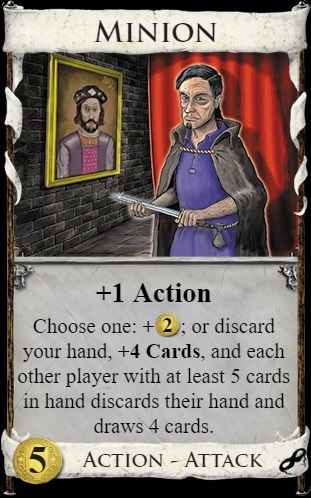 The Bite-Sized series of articles is meant to take the most powerful cards in Dominion and give a short explanation of what makes them powerful. Minion’s presence often leads to games that focus around getting as many copies of Minion as possible. Its flexibility to be used as either draw or payload enables decks with lots of copies of Minion to be both powerful and somewhat consistent. Support for Minion usually comes in the form of “virtual payload,” meaning payload that happens in the action phase of your turn, which sidesteps Minion’s drawback of forcing you to discard your hand when used for draw. Minion also likes to be able to trash cards that aren’t virtual payload, such as treasure cards. On top of this, though the attack portion of Minion is often underestimated, it is often more powerful than other discard attacks. This means that playing other decks gets worse, as Minion serves a soft counter to its own attack. This entry was posted in Bite-Sized, Dominion, Tabletop Games on April 6, 2019 by Adam Horton.